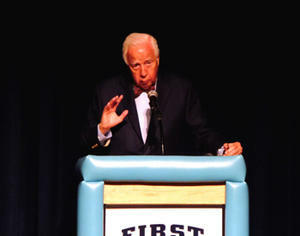 David McCullough speaking at First Flight High School. What a great Memorial Day Weekend gift we just had on the Outer Banks. Pulitzer Prize winning author and Presidential Medal of Freedom recipient David McCullough was on the Outer Banks to promote his latest book, The Wright Brothers. Speaking before a standing room only audience at the First Flight High School auditorium, McCullough’s lecture was filled with humor, insight and wisdom. He talked at length about family and how the strength of Wilbur and Orville’s family sustained them in their quest to bring flight to the world. The book itself is a great read and highly recommended. Although McCullough’s books are about the historic events and people at the center of them, he does not write dry books of events, one stacked upon the next. Rather his interest is in the human element, the people who create the great events, and that fascination with the individual creates a book of a historic time that reads like a novel. This is the second visit McCullough has made to the Outer Banks at the request of the Don and Catharine Cultural Arts Series, and there are certain themes that he does return to-the American spirit of perseverance in the face of what appears to be failure was key to the Wright Brothers success, and is point that McCullough makes in a number of different ways.